Celebrate Independence Day in style this year while watching the famous Macy’s Fourth of July fireworks atop some of NYC’s hottest rooftop lounges. The 35th annual extravaganza returns to the Hudson River this year, where 40,000 fireworks will light up the sky in this magnificent 25-minute show starting at 9:20pm. Macy’s recommends spots with unobstructed views of the sky above the river, with best views located below 59th Street closest to 11th and 12th avenues. We invite you to join us on our favorite west side rooftop spots as we seek a view of the fireworks with a side of glamour. AVA Lounge: This elegant lounge with a South Beach flair is located on the penthouse of the Dream Hotel and provides gorgeous panoramic views of the Hudson River to Times Square. Sip on the Apple Martini or Tiger Lily Martini, favorites at the lounge, for the big show. More information about drink specials and reservations for the evening are available by calling 212-956-7020 or emailing reservations@loungebarsnyc.com. Hudson Hotel Sky Terrace: As a classic Ian Schrager property, the Hudson Hotel has always attracted the fabulous to its 15th floor terrace. Kvell over the Hudson River views and bustling Ninth Avenue or swing in a hammock as you enjoy the fireworks. The private landscaped terrace is only available to hotel guests, so if you’re looking for a mini holiday escape or even a staycation, this is the place to be. 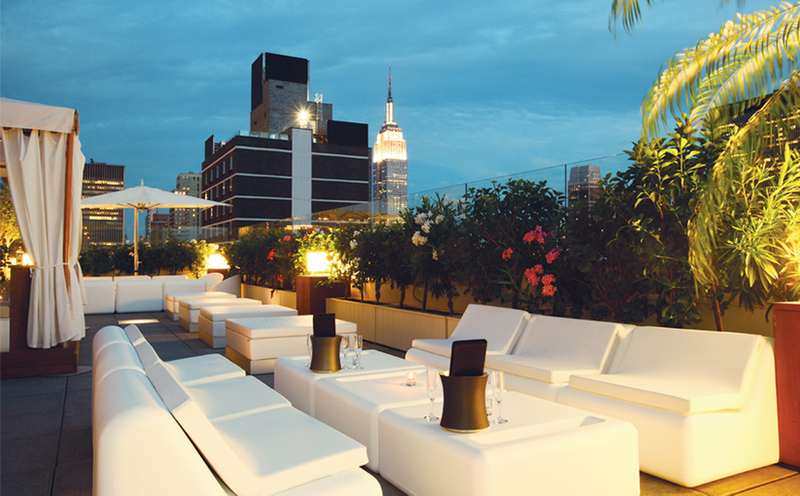 Plunge Bar & Lounge: Plunge is set on the 14th floor of the super trendy Hotel Gansevoort and is always a party. The scene is known to get quite crowded, so make sure to make a reservation. Plunge’s pool is open only to hotel guests, but you can cool down with one of the bar’s newest summer cocktails: the Morning Squeeze, a kiwi-based gin drink, or the Mambo #8. PRESS Lounge: Located on 11th Avenue at the Ink48 hotel, PRESS is the perfect place to view the show. PRESS has spectacular unobstructed views of the river with both a glass-enclosed lounge and lofty outdoor deck. Order a few drinks and any of the fabulous dessert offerings by Executive Pastry Chef Heather Carlucci-Rodriguez, or go all out and enjoy an open bar and New-American farm fresh cuisine from 6pm-10pm for $300 per person. Sky Room: Where better to watch the fireworks than atop New York City’s highest rooftop lounge? Sky Room sits on the 33rd and 34th floors of the Fairfield Inn and Suites by Marriott Times Square and has five distinct spaces including the Private Salon, North Terrace, South Terrace, Cube balcony and Times Square Lounge. Tickets for the Fourth are available for $100 per person and including a five-hour premium open bar from 6pm-11pm and a Fourth of July picnic with mini sliders, pigs in a blanket, buffalo chicken tenders and potato chips. VIP tables are also available. The party runs all night from 4pm-4am. This entry was posted on Friday, July 1st, 2011 at 3:44 pm	and is filed under Stuff to Do. You can follow any responses to this entry through the RSS 2.0 feed. You can leave a response, or trackback from your own site. Great idea! Makes the planning to find a perfect viewing spot much less hectic. Going to try to get into PRESS–been there for drinks and the views are to die for. Sky Room is one of my favorite places in NYC. So beautiful and almost magical. You can go to these places any time of the year — don’t wait for the Fourth of July. PRESS is especially wonderful for the sunsets. Thanks a lot. Very interesting article! Hiya, I am really glad I have found this information. Today bloggers publish just about gossips and web and this is really irritating. A good site with interesting content, this is what I need. Thank you for keeping this website, I’ll be visiting it. Do you do newsletters? Can’t find it.